Southwestern North America and other subtropical regions are going to become increasingly arid as a consequence of rising greenhouse gases. The transition to a drier climate should already be underway and will become well established in the coming years to decades, akin to permanent drought conditions. This is a robust result in climate model projections that has its source in well represented changes in the atmospheric hydrological cycle related to both rising humidity in a warmer atmosphere and poleward shifts of atmospheric circulation features. Low water at Lake Powell (April 2003. Farley Canyon), photo by Eric Nyre, Canoe Colorado. Projections of anthropogenic climate change conducted by nineteen different climate modeling groups around the world, using different climate models, show widespread agreement that Southwestern North America - and the subtropics in general - are on a trajectory to a climate even more arid than now. According to the models, human-induced aridification becomes marked early in the current century. In the Southwest the levels of aridity seen in the 1950s multiyear drought, or the 1930s Dust Bowl, become the new climatology by mid-century: a perpetual drought. A PDF of the complete article (Seager et.al, 2007) can be downloaded from Science Express. The subtropics are already dry because the mean flow of the atmosphere moves moisture out of these regions whereas the deep tropics and the higher latitudes are wet because the atmosphere converges moisture into those regions. As air warms it can hold more moisture and this existing pattern of the divergence and convergence of water vapor by the atmospheric flow intensifies. This makes dry areas drier and wet areas wetter. As the planet warms, the Hadley Cell, which links together rising air near the Equator and descending air in the subtropics, expands poleward. Descending air suppresses precipitation by drying the lower atmosphere so this process expands the subtropical dry zones. At the same time, and related to this, the rain-bearing mid-latitude storm tracks also shift poleward. Both changes in atmospheric circulation, which are not fully understood, cause the poleward flanks of the subtropics to dry. Besides Southwestern North America other land regions to be hit hard by subtropical drying include southern Europe, North Africa and the Middle East as well as parts of South America. The dynamical causes of imminent subtropical drying appear distinct from the causes of historical North American droughts such as occurred in the 1950s and during the 1930s Dust Bowl. Climate modeling has led to those being related to small, naturally occurring, changes in tropical Pacific (and, to a lesser extent, tropical Atlantic) sea surface temperature that also drive a change in atmospheric circulation that places anomalous descent over Southwestern North America. See our Drought Research homepage and the page on the Causes and consequences of the nineteenth century droughts in North America. The succession of 'megadroughts' - droughts like the Dust Bowl but which lasted for decades at a time - that occurred in the West in Medieval times have also been linked to equally persistent La Niña-like conditions in the tropical Pacific. However it is thought that the Sun was relatively strong at this time and volcanism weak which both would have resulted in positive radiative forcing of the climate system akin to rising greenhouse gases today. The differences and similarities of future drying with the Medieval megadroughts, and their global atmosphere-ocean contexts, needs to be determined. See our page on the North American Medieval megadroughts. In contrast to historical droughts, future drying is not linked to any particular pattern of change in sea surface temperature but seems to be the result of an overall surface warming driven by rising greenhouse gases. Evidence for this is that subtropical drying occurs in atmosphere models alone when they are subjected to uniform increases in surface temperature. Will this really happen and what are the implications? Imminent drying of the Southwest and subtropics in the models is such a robust result because it does not depend on poorly understood and highly parameterized parts of the model (such as cloud physics) but instead arises as a response of the large scale atmospheric dynamics - which we think is quite well represented in models - to a warming world. Similarly there is little reason to think that the models are wrong to have this response even if the dynamics involved need to be fully worked out. 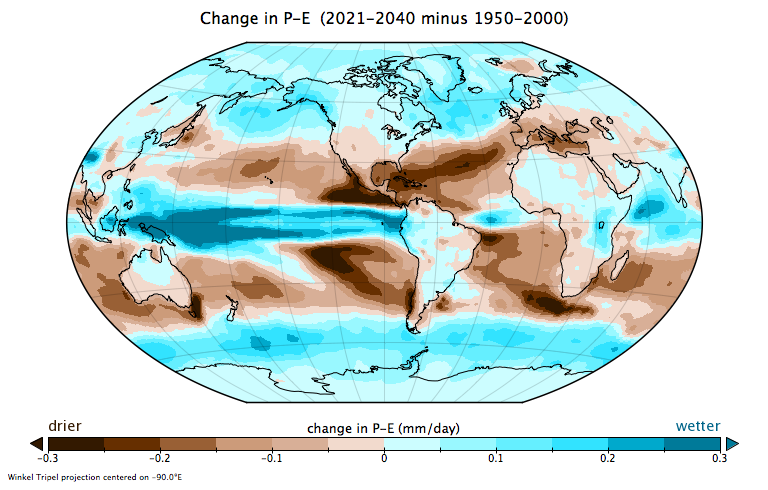 Change in precipitation (P) minus surface evaporation (E) for the 2021-2040 period minus the average over 1950-2000. Results are averaged over simulations with 19 different climate models. P-E is the net flux of water at the surface that, over land, sustains soil moisture, groundwater and river runoff. Figure by N. Naik. How could we tell if this is happening? The historical droughts were forced by natural variability of the tropical atmosphere-ocean system: persistent La Niña-like events in the tropical Pacific with a warm subtropical North Atlantic sometime playing a supporting role. Future drying is caused by overall warming. The aspect of the atmospheric circulation common to both is poleward shifted jet streams and mid-latitude storm tracks. But there are important differences that may allow identification of whether any drought that occurs is a naturally occurring one - and can be expected to end - or is anthropogenic - and can be expected to continue. For example droughts associated with persistent La Niña events involve increased heat uptake in the eastern and central equatorial Pacific Ocean and, hence, a cool tropical troposphere. The atmospheric dynamical response to this induces warming in the mid-latitudes. In contrast anthropogenic droughts will go along with warming almost everywhere and a maximum warming in the upper tropical troposphere. The tropical and subtropical zonal mean zonal winds are, necessarily, also distinct for natural and anthropogenic droughts. These differences may allow identification of onset of anthropogenic drying. Why La Niña events and global warming both induce subtropical drying is an active topic of research in atmospheric dynamics. Click on the thumbnail on the right for a relevant figure. See also the GFDL Climate Modeling Research Highlight (volume 1, n5): Will the wet get wetter and the dry drier? This work was performed as a collaboration of the scientists at Lamont-Doherty Earth Observatory (R. Seager, M.F. Ting, Y. Kushnir, H.-P. Huang, J. Velez, C. Li, N. Naik) NOAA Geophysical Fluid Dynamics Laboratory (I.M. Held, G. Vecchi, N.-C. Lau, A. Leetmaa) the National Center for Atmospheric Research (J. Lu) and Tel-Aviv University (N. Harnik). 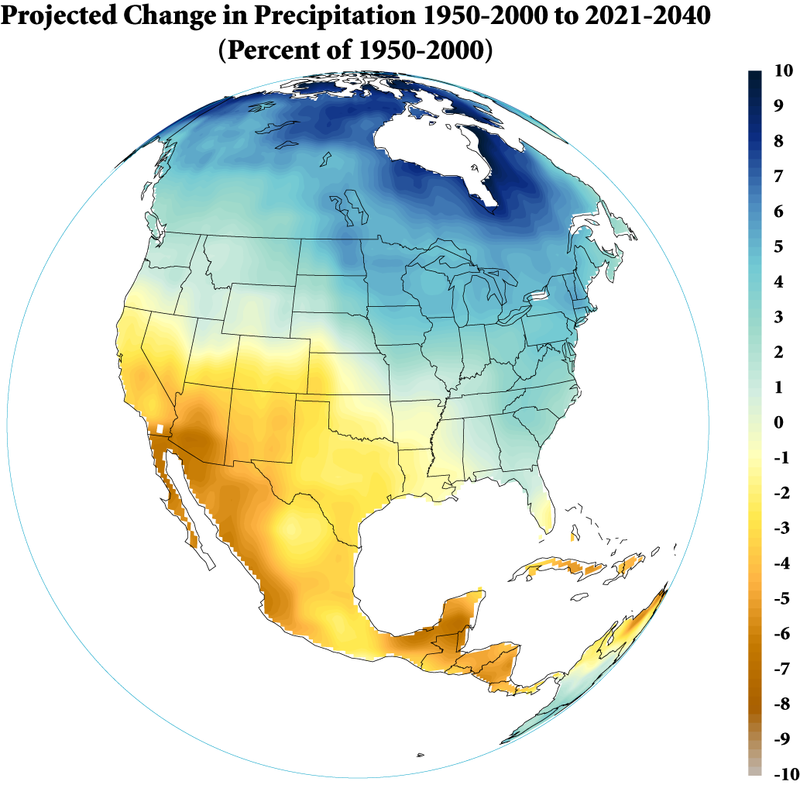 Projected change in precipitation for the 2021-2040 period minus the average over 1950-2000 as a percent of the 1950-2000 precipitation. Results are averaged over simulations with 19 different climate models. Figure by G. Vecchi. "Denial in the Desert" by Mike Davis. The Nation, Tuesday, April 3, 2007. "Return of the dust bowl? 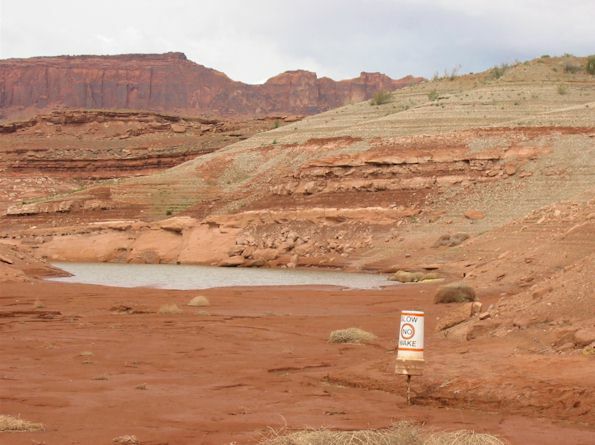 Climate change set to make the arid southwest even drier" by Daemon Fairless. news@nature.com, Thursday, April 5, 2007. "Study Sees Drought Trend in U.S. Southwest". NPR , Friday, April 6, 2007,The Day to Day Program. And too many others to mention, see the Google news search for Friday Afternoon, April 6, 2006. Opinions expressed are those of the authors and not necessarily those of their institutions. Copyright © 2011 by The Trustees of Columbia University in the City of New York, Lamont-Doherty Earth Observatory.